Don’t forget to check out Holly’s trim& TERRIFIC cookbooks on Amazon, too! One of my favorite ways to show Mom how special she is with a wonderful, stress-free brunch. And don’t worry, no one ever said brunch meant spending an entire morning in the kitchen. 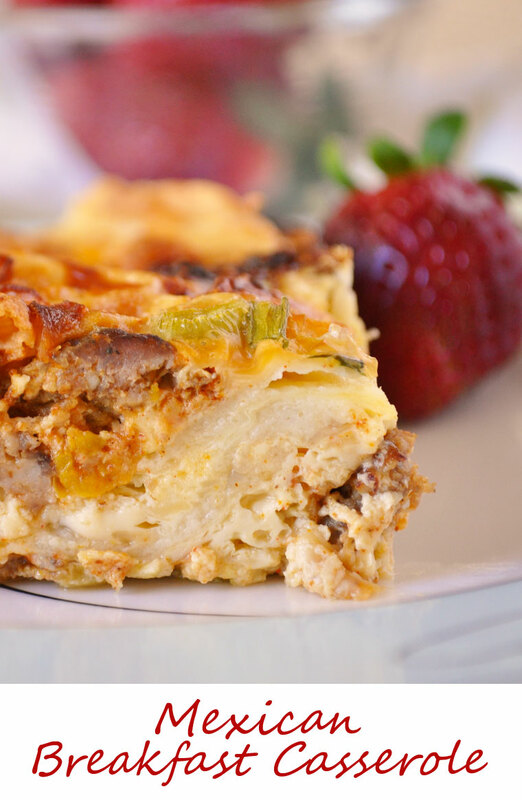 Mexican Breakfast Casserole is great because you can make it ahead of time to surprise your family the next morning. Prepare and put together easily the night before and simply bake in the morning so the whole family will wake up to the enticing smell of this fabulous dish. This hearty breakfast recipe is so full of flavor made with tortillas, green chilies, and turkey sausage – use corn tortillas for a gluten free meal. Impress your mom with this easy yet special one-dish meal for breakfast – just serve with juice and maybe pick a flower from the garden! While she’s enjoying her breakfast, present her with a special homemade gift – Easy Homemade Brown Sugar Scrub. It can easily be made by the kids as a lovely homemade gift for mom or grandma! Simple ingredients magically create this make-ahead scrumptious breakfast dish fulfilling everyone’s expectations in my house. Recipe and photos used with permission of the author.